Luther on Wittenberg: "Away from this Sodom"
Here's a Luther quote from the book, Henry O'Connor, Luther's Own Statements Concerning His Teaching and Its Results: Taken Exclusively from the Earliest and Best Editions of Luther's German and Latin Works (1884), p. 56. The town of Wittenberg was the principal scene of Luther's activity. It was there that he resided. It was there, if anywhere, that the results of his teaching ought to have made themselves felt. Now, about seven months before his death, Luther wrote to his wife,"Away from this Sodom (Wittenberg) I will wander about, and sooner beg my bread than allow my poor old last days to be martyred and upset with the disorder of Wittenberg (Luther's Letter to his Wife, July, 1545, de Wette V. 753)"
This letter has been in translated into English in LW 50:273-278. The exact quote in found at LW 50:279. There are alternate translations of this letter: The Life and Letters of Martin Luther By Preserved Smith, page 416; Martin Luther: The Man and His Work by Arthur Cushman McGiffert, p. 416. In this letter Luther tells Katie first that John will report details about the trip, and that they all received much hospitality on the way. Then Luther informs Katie that he is disgusted with moral conditions in Wittenberg and would like to arrange matters so that he would not have to return to Wittenberg. He feels that the people of Wittenberg would make difficulties for his family anyhow, once he had died; and so he suggests that Katie now dispose of their properties in Wittenberg and move to Zölsdorf. He hopes that the Elector will continue to pay his salary for this year, which he feels might well be the last year of his life, and that this salary would enable him to improve the estate in Zölsdorf. 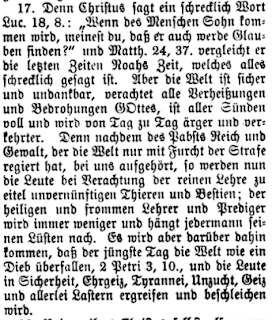 Luther tells his wife that “the day after tomorrow” he will drive to Merseburg to visit George of Anhalt. 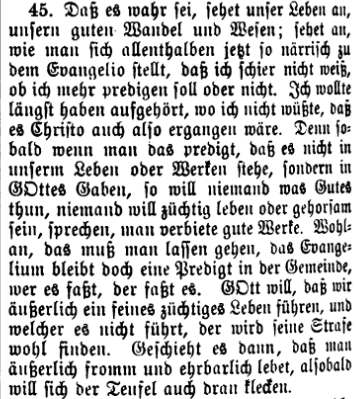 In closing, Luther leaves it up to his wife to decide whether to inform Melanchthon and Bugenhagen of his intention not to return to Wittenberg; if his wife does tell them, then she is to ask Bugenhagen to inform the congregation of Luther’s decision, and to say farewell to the congregation in Luther’s name. Luther had considered leaving Wittenberg in protest before he wrote the present letter. But the determination with which Luther spoke in the present letter was a considerable shock for the University and the town. Luther’s colleagues immediately conjectured that Luther wanted to leave Wittenberg because of doctrinal differences which existed between Luther and “one” of Luther’s colleagues.﻿﻿ On August I the University wrote to Elector John Frederick, enclosing a copy of the present letter,﻿﻿ and informing the Elector that the University would deputize Bugenhagen and “some others” to negotiate with Luther for his return. The University requested the Elector to summon Luther and try to influence him to change his mind. As a result of this request, the Elector deputized his personal physician, Matthias Ratzeberger,﻿﻿ to deal with Luther; Ratzeberget was to confer with Melanchthon first, however.﻿﻿ Ratzeberger was to give Luther the Elector’s personal letter (a masterpiece of psychological diplomacy) and, along with von Amsdorf, Melanchthon, Bugenhagen, and Major, to persuade Luther to change his mind. 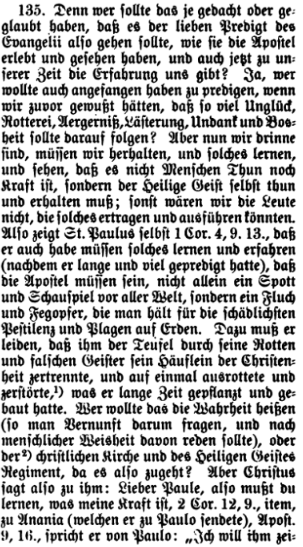 Contrary to Melanchthon’s assumption﻿﻿ that Luther’s decision to leave Wittenberg had something to do with doctrinal matters, it is clear, on the basis of a letter written by Ratzeberger,﻿﻿ that Luther’s decision was based on his disappointment with and anger about the conditions in Wittenberg; the decision was apparently actually made (on the spur of the moment) under the impact of some stories about Wittenberg which Luther heard in the countryside.﻿﻿ The Elector and Brück had a much more realistic view of the situation than Melanchthon had.﻿﻿ The Elector simply talked about those complaints Luther had which he felt could be settled. And Brück argued that one should not make so much ado about it all, saying that, thank God, it would not be as easy to dispose of the property as Luther thought it would be; while Brück was well aware that Luther might be stubborn and remain “sitting on his head,” he also realized that in view of the problems which would arise in connection with the sale of Luther’s property, the last word on this matter had not yet been spoken. How serious Luther was about his decision to leave Wittenberg could not be ascertained. His continued absence from Wittenberg without any given reason seems to indicate that Luther was indeed serious. On the other hand, while in Merseburg, Luther supposedly was promised “in the name of the church and the state” that the poor moral conditions in Wittenberg would be corrected;﻿﻿ according to Köstlin-Kawerau,﻿ after Luther’s return to Wittenberg, the city council and the University did indeed draft (upon the Elector’s orders) ordinances directed against the poor public behavior which supposedly had caused Luther’s anger. Since Luther left Merseburg on August 7 or 8, the issues must have been well on the way to being settled by that time. In any case, Luther did eventually return to Wittenberg, and Ratzeberger and Melanchthon﻿﻿ had accomplished their missions. 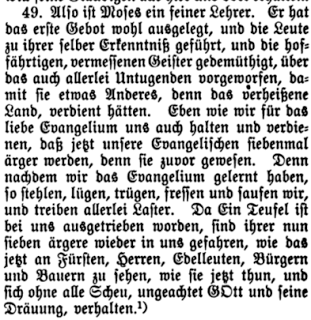 While obviously the promises made to Luther at Merseburg and the “arm-twisting” by his friends played some part in Luther’s change of heart, the fact that Luther may in any event have had second thoughts about his decision to leave Wittenberg must not be discounted (LW 50:273-277). To my kind and dear mistress of the house, Luther’s Catherine von Bora, a preacher, a brewer, a gardener,﻿﻿ and whatever else she is capable of doing- Grace and peace! Dear Katie! ﻿I would like to arrange matters in such a way that I do not have to return to Wittenberg. My heart has become cold, so that I do not like to be there any longer. I wish you would sell the garden and field, house and all.﻿﻿ Also I would like to return the big house﻿﻿ to my Most Gracious Lord.﻿﻿ It would be best for you to move to Zölsdorf﻿﻿ as long as I am still living and able to help you to improve the little property with my salary.﻿﻿ For I hope that my Most Gracious Lord would let my salary be continued at least for one [year], that is, the last year of my life.﻿﻿ After my death the four elements﻿﻿ at Wittenberg certainly will not tolerate you [there]. Therefore it would be better to do while I am alive what certainly would have to be done then. As things are run in Wittenberg, perhaps the people there will acquire﻿ not only the dance of St. Vitus﻿﻿ or St. John,﻿but the dance of the beggars or the dance of Beelzebub, since they have started to bare women and maidens in front and back,﻿﻿ and there is no one who punishes or objects.﻿﻿ In addition the Word of God is being mocked [there]. Away from this Sodom!﻿﻿ If Leeks Bachscheisse,﻿ our other Rosina,﻿ and [her] seducer﻿ are not yet imprisoned, then help as much as you can to see that this scoundrel loses what he has gained.﻿﻿ While in the country I have heard more than I find out while in Wittenberg.﻿﻿ Consequently I am tired of this city and do not wish to return, May God help me with this. 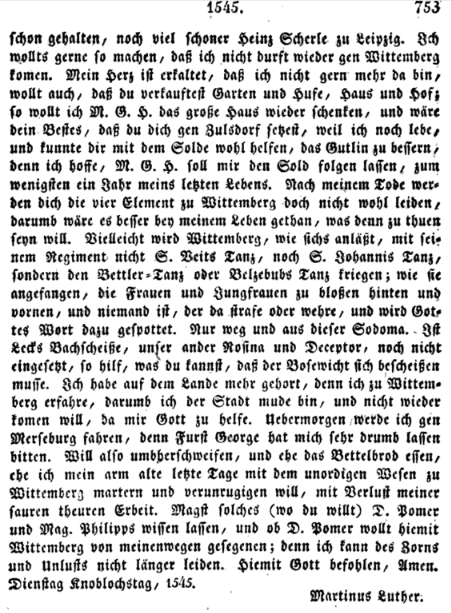 The day after tomorrow﻿﻿ I shall drive to Merseburg, for Sovereign George﻿﻿ has very urgently asked that I do so.﻿﻿ Thus I shall be on the move, and will rather eat the bread of a beggar than torture and upset my poor old [age] and final days with the filth at Wittenberg which destroys my hard and faithful work.﻿﻿ You might inform Doctor Pomer﻿﻿ and Master﻿﻿ Philip﻿ of this (if you wish), and [you might ask] if Doctor Pomer would wish to say farewell to Wittenberg in my behalf. For I am unable any longer to endure my anger [about] and dislike [of this city]. With this I commend you to God. Amen. Here an alternate English translation found in The life and letters of Martin Luther By Preserved Smith, page 416. Away with this Sodom. Our other Rosina and deceiver is Leak's dung, and yet not in prison; do what you can to make the'wretch stultify himself. I hear more of these scandals in the country than I did at Wittenberg, and am therefore tired of that city and do not wish to return, God helping me. Day after to-morrow I am going to Merseburg, for Prince George has pressed me to do so. I will wander around here and eat the bread of charity before I will martyr and soil my poor old last days with the disordered life of Wittenberg, where I lose all my bitter, costly work. You may tell Melanchthon and Bugenhagen this, if you will, and ask the latter to give Wittenberg my blessing, for I can no longer bear its wrath and displeasure. God bless you. Amen. Leaving the context of Luther's statement aside for a moment, consider a few points. Is O'Connor's argument biblically true? Were those "chosen by Almighty God" guaranteed the results of "an increase of virtue and a decrease of vice"? Think of the Old Testament prophets. They typically came with messages that the people did not heed, nor want to hear- and this provoked God's judgment. If one were to evaluate their calling and ministry based on O'Connor's paradigm, we could throw out more than a few prophets. Consider some of the early churches in the New Testament as well. Corinth was given a rather pure dose of apostolic teaching, was it not? When one reads 1 and 2 Corinthians, the moral state of the church described by Paul is less than stellar. Latter on in an an early post-biblical document, 1 Clement, we find the Corinthian church still in disarray. Or, take the argument and apply it to Rome's infallible magisterium and pick a century or a recent decade. Therefore, O'Connor's argument is bogus if one uses the Bible as a determiner of truth. O'Connor is a typical defender of Rome using a "theology of glory" as the ultimate standard. It's important to note also Luther wasn't like many of the current post-millennial hopefulls. He did not expect the world to get better and better, culminating in a decrease of sin, and an increase in godliness on a mass scale, in order to usher in the kingdom of God. No, for Luther, it was the end of the world. He expected only a remnant to be saved as the world came to its end. Luther: Who would have begun to preach, if we had known beforehand that so much unhappiness, tumult, scandal, blasphemy, ingratitude, and wickedness would have been the result ? Writing on the same subject, he says: "If God had not closed, my eyes, and if I had foreseen these scandals, I would never have begun to teach the Gospel." In 1538, more than twenty years after the beginning of the Reformation, Luther dwells on the same thought: "Who would have begun to preach, if we had known beforehand that so much unhappiness, tumult, scandal, blasphemy, ingratitude, and wickedness would have been the result?" [Walch. VIII. 564]. There are two Luther quotes above. The first quote ("If God had not closed, my eyes...") has been covered previously. This entry will examine the second quote from 1538. This later quote pops up every once in a while. It's typically used by Rome's defenders as proof of the failure of the Reformation (or something like Luther's regrets or concession to the failure of the Reformation, etc. (example #1, example #2, example #3, example #4, example #5, here's a version of it from of all places, vatican.com). I've seen it used as speculation that Luther "lamented often about the actual course of his 'Reformation' in Germany, thus perhaps revealing a sense of failure and guilt." O'Connor uses it to describe the "Results of Luther's Teaching," specifically, the "Moral Results" that there was a "Lower State of General Morality." In 2010 I explored this 1538 quote but was unable to locate the context. This time I was successful. This paragraph contains some of Luther's comments on John 16:13. O'Connor says the quote is from 1538, LW says Luther lectured on John 14-16 in 1537 and the material on John 16 was published in 1539 (LW 24:preface). Technically, Luther did not write this text. These printed words are from the notes of Caspar Cruciger "who acted as the amanuensis for Luther's sermons" (LW 24, preface). Because of Cruciger's editing, getting a specific date as to the exact date of Luther's sermons for this material is not possible. Cruciger turned the sermons into a commentary. Luther was fine with this. He spoke of it as the best book he had written, adding, "of course I did not write it" (LW 24:preface). This text has been translated into English in LW 24. The quote in question can be found on pages 357-358. 13. When the Spirit of truth comes, He will guide you into all the truth. Who would ever have thought or believed that the precious message of the Gospel would fare as the apostles experienced and saw, and as our own experience shows us today? Yes, who of us would have begun to preach if we had known in advance that so much misery, sectarianism, offense, blasphemy, ingratitude, and malice would ensue? But now that we are preaching, we must take the consequences and remember that this is not a human venture and that it does not depend on human power, but that the Holy Spirit Himself must do and preserve it. Otherwise we could not bear this and carry it out. In 1 Cor. 4:9–13 St. Paul himself points out that after preaching a great deal and for a long time he, too, has had to learn and experience that the apostles must not only be a mockery and a spectacle to the whole world but must be a curse and an offscouring, and be regarded as the most pernicious pestilence and plague on earth. An additional suffering he must bear is the dispersion and, at the same time, the extermination and destruction of the little flock of Christians it has taken him a long time to plant and care for. If one were to consult reason about this and to speak of it on the basis of human wisdom, who would call such happenings truth or the work of the Christian Church and the Holy Spirit? But this is what Christ says to Paul: “Dear Paul, in this way you have to become acquainted with My power” (2 Cor. 12:9). And to Ananias—whom He sends to Paul—Christ says of Paul: “I will show him how much he must suffer for the sake of My name” (Acts 9:16). Thus all Christendom is a small group that must submit to, suffer, and bear more than all other people whatever grief the devil and the world can inflict on it. Now who, in view of what they appear to be and are subjected to, will recognize and learn that they are genuine Christians? Reason will surely not show this. The Holy Spirit must do so. He is called “the Spirit of truth” because in spite of what they appear to be and are subjected to—according to which this message seems to amount to nothing and to be a pack of lies—He strengthens and preserves hearts in the faith. Otherwise no one would have believed for any length of time, or would still believe, that this Jesus Christ, who sits at the right hand of the Father forever, He who was so shamefully crucified as a malefactor by His own people, is true God? Or how could we conclude with certainty of our own accord that we, who believe in this crucified Christ and are condemned, cursed, and executed by the whole world as God’s enemies and the devil’s own, are actually God’s dear children and saints? After all, we ourselves do not feel this. In fact, our heart tells us something far different, because we are still sinners full of weakness. But this is the work of the Holy Spirit; it is His power; He confirms this in our heart. Therefore we can accept it as true in accord with His Word. He enables us to live and to die by this truth. Or who could believe that we unfortunate people, who are executed and die like the most miserable human beings on earth, who are buried in the ground, consumed by maggots and worms or are burned alive and reduced to ashes and dust, will all emerge from this stench, from ashes and dust, in the twinkling of an eye, with whole, clean, and shining bodies more radiant than all heaven, than the sun and the moon, more beautiful and precious than all gold and jewels, purer and more fragrant than all balsam, gardens, and Paradise? Of course, no one would ever get to the bottom of this on the basis of reason; for it is altogether too farfetched and entirely too unreasonable to suppose that a being as poor and miserable as is now evident should be destined for the greatness concerning which Scripture says that we shall be eternal heirs of God in heaven and shall live and be saved solely through faith and Baptism, even though we now still have sin and death in us (LW 24:357-359). The context clearly shows that this quote is not an example of Luther lamenting "often about the actual course of his 'Reformation' in Germany, thus perhaps revealing a sense of failure and guilt." Nor is O'Connor correct that the quote was intended to demonstrate the "Results of Luther's Teaching," specifically, the "Moral Results" that there was a "Lower State of General Morality." No, the quote is about the offense of the Gospel. Luther expected the Gospel to incite the activity of the Devil, particularly among those who did not embrace it. He expected the Gospel to cause division and trouble, and to infuriate the world against the true church. What should one do when facing such trouble? Regret preaching the Gospel? Countless statements from Luther could be provided proving Luther never regretted the Gospel or proclaiming the Gospel. 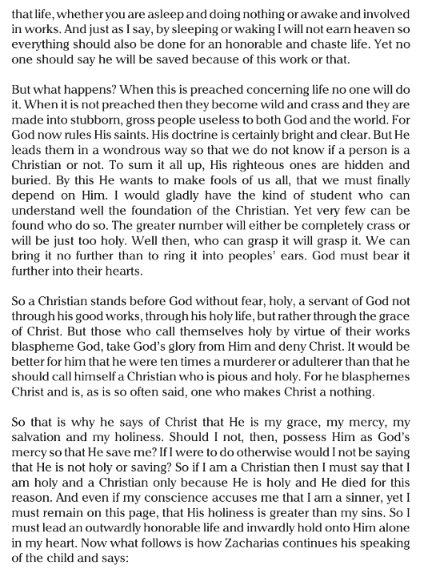 The context explains the proper course of action a preacher of the Gospel takes when he finds himself in midst of trouble: "we must take the consequences and remember that this is not a human venture and that it does not depend on human power, but that the Holy Spirit Himself must do and preserve it. Otherwise we could not bear this and carry it out." Who would want to preach the Gospel if they knew beforehand of all the trouble it was bring into one's life? No one, for that is the conclusion of human reason. But as the context states, The Holy Spirit is able to see one through, as he did with the early apostles, who likewise faced dire circumstances brought on by the Gospel. The Holy Spirit makes one fit for such work. The new Gospel did not even make Luther himself better. He said: "I confess . . . that I am more negligent than I was under the Pope and there is now nowhere such an amount of earnestness under the Gospel, as was formerly seen among monks and priests." (Walch, IX. 1311.) "If God," he says, "had not closed my eyes and if I had foreseen these scandals, I would never have begun to teach the Gospel" (Walch, VI, 920.) 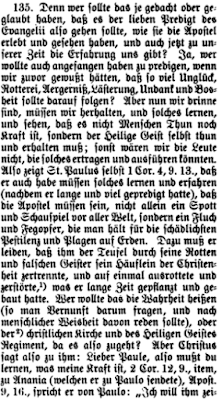 [p. 131]. The reason why there are two versions is because the former version was based on a transcript taken down by those who heard Luther speak. 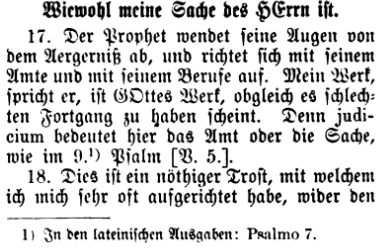 The later appears to be based on Luther's actual notes (LW 16:ix; LW 17:viii), first published in 1914. O'Connor did not have access to these notes and relied only on the transcript. The dates for Luther's lectures on Isaiah are bit sketchy. He began in 1527 and finished in 1530. There is an English rendering of the Latin text found in LW 17. The specific quote in question can be found on page 174. 4. But I said. There you have it. This is a powerful text. I have labored in vain, for nothing, etc. This is the lament of every preacher, that even though the Word is sure, he has so few disciples. “I preach, but there seems to be no fruit. All are leaving.” We had this experience. At first many applauded the Gospel. Later, when we attacked the Mass and other things, the nobles and monks became our enemies again. Here Christ in His own person complains about the small number of disciples. So we, too, experienced that we lost many. David had this offense in mind in Ps. 88:1: “O Lord, my God, I call for help.” Jeremiah, too, had this offense in mind (Lam. 2:20): “Should priest and prophet be slain in the sanctuary of the Lord?” “I am the only one left.” So Paul says after his labor in Asia that “all who are in Asia turned away from me” (2 Tim. 1:15). This is a fine pleasure! Therefore you must not give up if for your labor you get the reward of ingratitude. We must not lose hope, as though the Word were about to be destroyed. Let fall what may, let come what will. Jeremiah has his 7,000, Paul has his Corinthians, Ephesians, and Timothy. So the seed falls on the rock, on the road, among the thorns, and yet some also falls on good soil. This is the consolation for all preachers so that they do not lose hope, though the traitor Judas should come among the Twelve. Yet surely My right is with the Lord, and My recompense with My God. Thus He again consoles Himself against this extremely evil offense, as if to say, “it is not My fault.” For that reason He says Yet My right is with the Lord, that is, it is His cause and office. Ps. 7:6 reads: “Awake, O My God; Thou hast appointed a judgment,” that is, an office apart from a profane judgment. With the Lord, that is, “it pleases the Lord, because I have not found it and set it up, but the Lord has chosen Me.” And My work, that is, office, as Christ says, “the work which the Father commanded Me.” This consolation is necessary in the church when we see the scarcity of disciples in the church. As for me, Martin Luther, unless God had closed for me the eyes of reason, I would long ago have stopped preaching and have despaired. Now a boldness, or certainty, comes to my aid. Yet surely My right is with the Lord, although it seems empty and vain. It is nevertheless God’s work, even though I am deserted by brethren and attacked by tyrants. Yet this consolation and the witness of our conscience heartens us, as Paul says (2 Cor. 1:12). Yesterday I said that the words My right is with the Lord are the consolation of all those who preach in vain, although they do not preach in vain. But the paucity of the godly compared with the abundance of hearers seems so great that a remarkable emotion arises in the preacher, saying, “What if I should go astray, what if I should quit? Yet I have performed my office carefully and to the best of my ability.” Nevertheless, stand fast. Let fall and stand, who can (LW 17:173-174). Contrast this context with O'Connor's paradigm: "We find Luther owning that he would never have begun to preach, if he had foreseen these unhappy results, and that he scarcely knows whether he ought to continue preaching" (O'Connor, p.56). Really? Luther's Latin lecture notes provide a helpful context. Luther first lays out the plight of those who minister the Gospel, "I preach, but there seems to be no fruit." Those minsters who feel this way should first find comfort in that the same circumstances were found in the pages of sacred scripture. The second comfort is to be found in that the Lord calls His ministers to preach the Gospel. Reason says that a "scarcity of disciples in the church" points towards failure. But those who preach the Gospel are not to evaluate their ministry by reason, but rather stay faithful to the truth. They are empowered by the Holy Spirit who closes "the eyes of reason" and provokes "a boldness, or certainty." When Luther says "I would long ago have stopped preaching and have despaired," he's making the statement as a comfort to fellow preachers. "We find Luther owning that he would never have begun to preach, if he had foreseen these unhappy results, and that he scarcely knows whether he ought to continue preaching. His words are "See how foolishly the people everywhere behave towards the Gospel, so that I scarcely know whether I ought to continue preaching or not" [Walch. XI. 3052]. This quote pops up every once in a while. It's typically used by Rome's defenders as proof of the failure of the Reformation (or something like Luther's regrets or concession to the failure of the Reformation, etc. example #1, example #2). O'Connor uses it to describe the "Results of Luther's Teaching," specifically, the "Moral Results" that there was a "Lower State of General Morality." The text is from Luther's sermons on The Feast of Saint John the Baptizer, specifically The Benedictus, or Prophecy of Zechariah (Luke 1:57-80). Even though a four volume set from LW contains the Church Postil, the English translation of this particular sermon is found in Joel Basely's translation of Luther's Kirchenpostille: The Festival Sermons of Martin Luther (Michigan: Mark V Publications, 2005). The context for the quote can be found in the second part of the book, page 81. This sermon does not date from late in Luther's career, but rather the early 1520's. Here's a copy from 1525. I mention this because Rome's polemicists think Luther gradually became disheartened by the ineffectiveness of his Gospel preaching. This sermon should demonstrate to them that their paradigm is flawed based on the very quote they extracted from this writing. If they want to use the quote from this sermon, they have to at least admit that early in Luther's career, he felt the same way he did later in his career. I don't think Luther was being despondent or bemoaning the impact of his preaching. 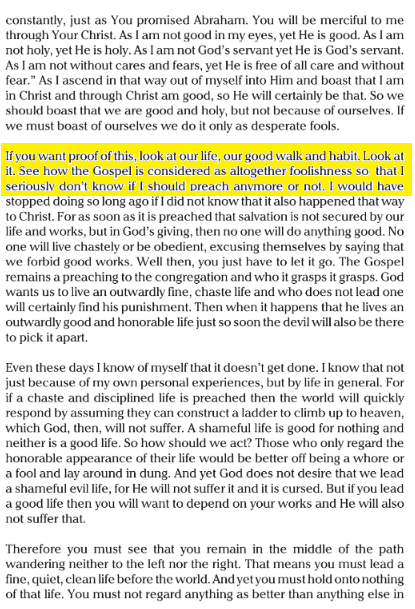 Luther says he was tempted to stop preaching the Gospel because it comes across to the world as foolish and people think because of the pure imputation of Christ's righteousness, no one need live a moral life. But as he continues, the masses also misinterpreted Christ's preaching, so he was in good company. He goes on to say: "The Gospel remains a preaching to the congregation and who it grasps it grasps." Where Rome's defenders see a despondent Luther, the context actually breathes of preaching the perfect righteousness of Christ and how that righteousness will both confound the world and will be a comfort to those plagued by their sins. Such a person is to live an outwardly honorable life, always though with the realization that the only honorable life accepted by God is the perfectly honorable life of Christ. 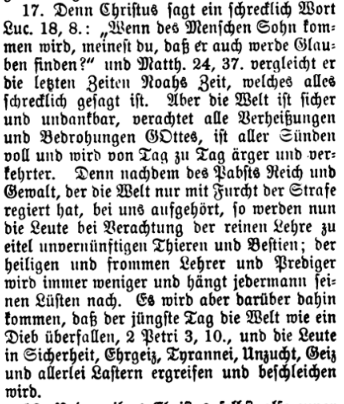 "About a year before his death, Luther confesses: "We are living in Sodom and Babylon everything is daily getting worse" [De Wette V. 722]. This quote is typically used by older generations of Rome's defenders as proof of the failure of the Reformation (or something like Luther's regrets or concession to the failure of the Reformation, etc.). O'Connor uses it to describe the "Results of Luther's Teaching," specifically the "Moral Results" that there was a "Lower State of General Morality." Above all the disintegration of moral and social life, the epidemic ravages of vice and immorality, and that in the very cradle of the Reformation, even in his very household, nearly drove him frantic. "We live in Sodom and Babylon, affairs are growing daily worse", is his lament (De Wette, op. cit., V, 722) [Catholic Encyclopedia. Link]. The "great work of the Reformation," i.e. 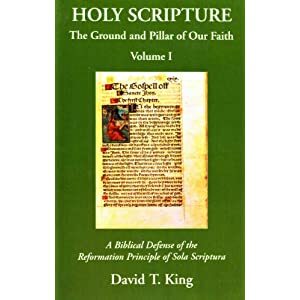 of real reform, to which Luther appeals unless he was prepared to regard it as consisting solely in the damage done to the Roman Church surely demanded that, at least at Wittenberg and in Luther s immediate sphere, some definite fruits in the shape of real moral amelioration should be apparent. 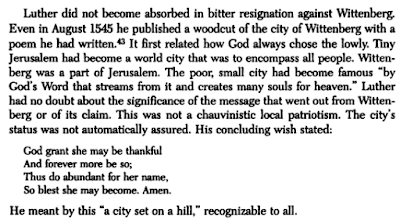 Yet it was precisely of Wittenberg and his own surroundings that Luther complained so loudly. 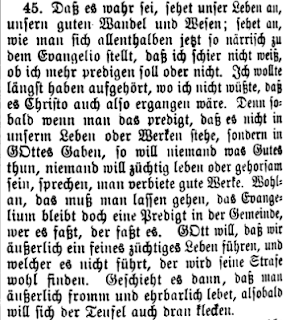 The increase of every kind of disorder caused him to write to George of Anhalt: "We live in Sodom and Babylon, or rather must die there; the good men, our Lots and Daniels, whom we so urgently need now that things are daily becoming worse, are snatched from us by death" (March 9, 1545, " Briefe," ed. De Wette, 5, p. 722, letter called forth by the death of -George Held Forchheim, to whom the Prince was much attached) [Hartmann Grisar, Luther 4:215]. 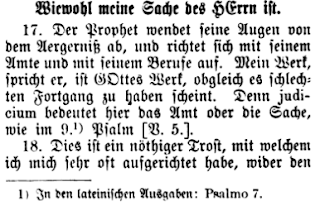 The footnote "De Wette V. 722" refers to page 722 in the fifth volume in a set of Luther's letters edited by Dr. Wilhelm Martin Leberecht de Wette (5 vols., Berlin, 1825-8), Dr. Martin Luthers Briefe, Sendschreiben und Bedenken. Page 722 can be found here. 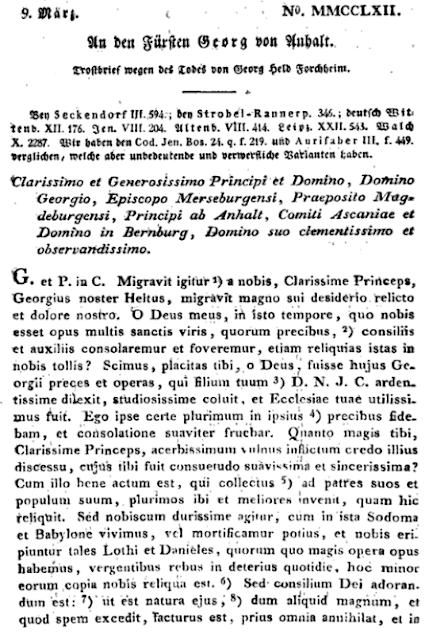 As Grisar mentioned above, this is a letter to Prince George of Anhalt, March, 9, 1545 in regard to the death of George Held, pastor of the church in Forchheim. Prince George was one of three brothers whose territories were favorable to the Reformation (See LW 38:142). To my knowledge, this letter has no official English rendering in any of the collections of Luther's writings. However, a lengthy section of it is included in John Scott, The History of the Church, pages 517-519. Grace and peace to you in Christ! So then, most illustrious prince, our friend Heldus is gone, leaving us to lament him! O my God, at a time when we have need of many holy men to comfort and strengthen us by their prayers, their counsels, and their assistance, thou takest away even the few that are left us! We know, O God, that the prayers and the labours of the departed, who most ardently loved and zealously served thy Son, our Lord Jesus Christ, and was most useful to thy church, were well-pleasing in thy sight.—Certainly I myself placed great confidence in his prayers, and derived great consolation from them. How severe a wound then must you have suffered, most excellent prince, by the removal of one with whom you lived on terms of such faithful and endeared friendship. But it is well with him. Gathered to his fathers and to his people, he finds more and better companions there than he has left behind. But our lot is trying, who live, or drag on a sort of dying existence, here in Sodom and Babylon, and find the number of good men diminish in proportion as the state of things, daily declining towards what is worse, requires an increase of them. But the wisdom of God is to be adored, who, when he is about to accomplish something great, and surpassing our hopes, first seems to annihilate all expectation, and to reduce us to despair: as it is written, He bringeth down to the grave, (ad inferos,) and bringeth up again. He does this, to teach us the exercise of faith, hope, and love towards him; and that we may learn to esteem things not seen above those which do appear, and against hope to believe in hope, and to depend on him who calleth things which are not as though they were. Then, while he takes away from us all his most pleasant gifts, and exhibits himself to us as if his kindness and his loveliness had come utterly to an end, at that very time he is thinking most especially, and I might almost say anxiously, the thoughts of love towards us. By means like these it is that the old man is slain—the body of sin destroyed. —Wherefore comfort yourself, most excellent prince, according to the rich measure in which it has been given you to know God the Father and his Son Jesus Christ our Lord, and to meditate on all the operations of his hands. It shall be my prayer, that the God of all consolation would confirm and strengthen you by his Holy Spirit, until the appointed end of these trials be accomplished. For, as it is said in Jeremiah, He doth not willingly grieve the childen of men. And Augustine says, God would not permit evil to exist, if he had not some greater good to bring out of it.—We are yet in the flesh, and know not what to ask or how to ask it; that is, to ask what is good for us: but He, who is able to do above all we ask or think, careth for us: he can do for us beyond what the narrowness of our hearts allows us to desire, or even to imagine. But it is necessary, in order to his doing this, that he should first take from us those things which we think we cannot do without; or at least think that their absence would occasion us great injury or great danger. Scripture abounds with examples to this effect. Adam and Eve were almost intoxicated with high expectations from Cain: God deprived them of both their sons, and almost reduced them to despair: but then He that quickeneth the dead, and createth all things out of nothing, gave them another seed, and an unfailing posterity. Abraham promised himself great things from Ishmael, Isaac from Esau, Jacob from Reuben, his first born; but all these hopes must receive a death-blow, that new and immortal hopes might take their place. God is mighty and faithful: he promises and he performs.— Let us bewail our departed friend then, because his light is lost, as the son of Sirach says, yet not to himself but to us. To him his light burns more brightly, and shall burn for ever. Soon too our light shall fail here, but be rekindled and perfected in that better state, through him who is at once our Light and our Life. Amen! In Him may your highness ever fare well !" At the beginning of this entry I cited three Roman Catholic historians referring to this letter. O'Connor used it to describe Luther's confession to the negative moral results of his teaching. The Catholic Encyclopedia used it to demonstrate "the disintegration of moral and social life," and "the epidemic ravages of vice and immorality... in the very cradle of the Reformation, even in his very household, [which] nearly drove him frantic." Hartmann Grisar (the tamest of the three) used it to demonstrate that Luther's was not a "great work of the Reformation" or of "real reform" because at Wittenberg (Luther's place of residence), he "complained" about the behavior of the general population. One wonders if any of these three men actually read this letter- which was overtly pastoral in nature devoted to the needs of someone else. It was not a letter of Luther complaining or bemoaning his own personal situation in Wittenberg. 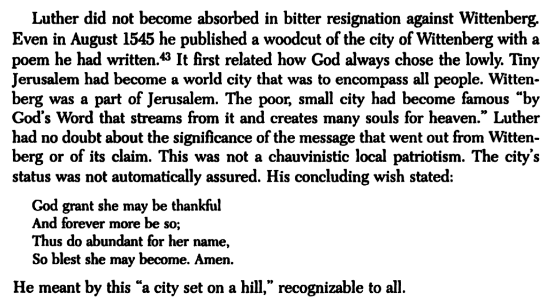 It isn't even certain if Luther was referring to Wittenberg in this letter or if he was referring to the general state of the world (it appears to me he may have simply meant the later). The town of Wittenberg was the principal scene of father's activity. It was there that he resided. It was there, if anywhere, that the results of his teaching ought to have made themselves felt. Now, about seven months before his death, Luther wrote to his wife, "Away from this Sodom (Wittenberg)... I will wander about, and sooner beg my bread than allow my poor old last days to be martyred and upset with the disorder of Wittenberg" (Luther's Letter to his Wife, July, 1545, de Wette 753-) (p.56). Every reasonable person will agree with me, that Luther can only have been a Reformer chosen by Almighty God, if his teaching caused an increase of virtue and a decrease of vice. If, however, it can be plainly shown, that in consequence of his teaching there was, on the contrary, an increase of vice and a decrease of virtue, we must come to the conclusion, that Luther had not the sanction of God for the work which he undertook (p.50). I've covered this notion from O'Connor previously. This sentiment captures the gist of the earlier generations of Rome's polemicists. They are correct that towards the end of his life Luther lamented over Wittenberg to the point of briefly leaving (see LW 50:273-281). Set aside the notion of Luther's despondency over Wittenberg for a moment and consider the following:. Is O'Connor's argument biblically true? Were those chosen by God in the role of prophets, teachers, or preachers guaranteed the results of "an increase of virtue and a decrease of vice"? Think of the Old Testament prophets. They typically came with messages that the people did not heed, nor want to hear- and this provoked God's judgment. If one were to evaluate their calling and ministry based on O'Connor's paradigm, we could throw out more than a few prophets. Consider some of the early churches in the New Testament as well. Corinth was given a rather pure dose of apostolic teaching, was it not? When one reads 1 and 2 Corinthians, the moral state of the church described by Paul is less than stellar. Latter on in an an early post-biblical document, 1 Clement, we find the Corinthian church still in disarray. Or, take the argument and apply it to Rome's infallible magisterium and pick a century or a recent decade. As has been expressed in a number of other Beggars All entries, Luther had no expectations that the Gospel would transform the masses of society. For Luther, it was the end of the world. Things were going to get worse. The Gospel was going to be fought against by the Devil with all his might. The true church was a tiny flock in a battle against the world, the flesh, and the Devil. He hoped the people would improve with the preaching of the Gospel, he often admitted he knew things were going to get worse because of the Gospel. 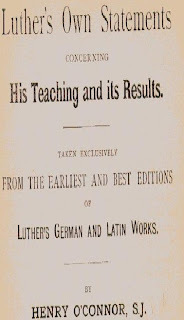 Here's a Luther quote from the book, Henry O'Connor, Luther's Own Statements Concerning His Teaching and Its Results: Taken Exclusively from the Earliest and Best Editions of Luther's German and Latin Works (1884), p. 55-56. "After the dominion and power of the Pope has ceased . . . the people, while despising the true doctrine, are now changed into mere irrational animals and beasts; … the number of holy and pious teachers becomes constantly less" [Walch. I. 615]. This quote pops up every once in a while. It's typically used by Rome's defenders as proof of the failure of the Reformation (or something like Luther's regrets or concession to the failure of the Reformation, etc. example #1, example #2). O'Connor uses it to describe the "Results of Luther's Teaching," specifically the "Moral Results" that there was a "Lower State of General Morality." The text has been translated into English in LW 1:336. But the Cainites, too, had their glory: the wisest men in every field of human endeavor and the finest hypocrites, who were the instigators of very much trouble for the true church and in various ways maltreated the holiest patriarchs, so that we deservedly count these among the holiest martyrs and confessors. As Moses stated above, the Cainites immediately began to be superior in number and in activity. Although they were compelled to show respect to their father Adam, they tried in various ways to oppress the church of the godly, especially after Adam, the first patriarch, had died. Therefore the Cainites accelerated the punishment of the Flood with their wickedness. But this power and malice of the Cainites was the reason why the holy patriarchs taught their church so much more zealously and carefully. How many important sermons do we suppose were delivered by them in that entire course of years, when Adam and Eve told about their first state and the glory of Paradise, and gave admonitions to be on guard against the serpent, who through sin became the cause of so many evils! How careful shall we suppose them to have been in explaining the promise concerning the Seed; how sensible in cheering the hearts of their people that the latter might not become discouraged by the grandeur of the Cainites or by their own afflictions! All these details Moses passes over, both because they could not be written down on account of their profusion and because their disclosure is reserved for that day of glory and deliverance. Thus although the Flood was a most horrible event, nevertheless Moses’ description of it is very brief; for he wanted to leave it to men to ponder over events of such magnitude. So in this passage Moses wanted to present briefly some picture of the first and original world. It was very good. Nevertheless, it had a large number of very wicked men, so that only eight souls were preserved in the Flood. What do we suppose will happen before the Last Day? For now, when the Gospel has been brought to light, so many despise it that it is to be feared that they will shortly predominate and fill the world with their errors, and the Word will be altogether suppressed. Awe-inspiring indeed are the words of Christ when He says (Luke 18:8): “Do you think that the Son of Man will find faith when He comes?” And in Matt. 24:37 He compares the last times with the times of Noah. These are terrifying statements. But the smug and ungrateful world, the despiser of all the promises and threats of God, abounds with every kind of iniquity and daily becomes more and more corrupt. Now that the rule of the popes, who have ruled the world solely through the fear of punishment, is over, men, through their contempt of the sound doctrine, all but degenerate into brutes and beasts. The number of holy and godly preachers is on the decline. All men yield to their desires. But what will happen is that the Last Day will come upon the world like a thief (1 Thess. 5:2) and will overtake men who in their smugness give free reign to their ambitious desire, tyranny, lusts, greed, and all sorts of vices. Furthermore, Christ Himself has foretold these developments, and so it is impossible for us to believe that He has lied. But if the first world, which had so large a number of most excellent patriarchs, became so pitiably depraved, how much more should we fear when the feebleness of our nature is so great? Therefore may the Lord grant that in faith and in the confession of His Son Jesus Christ we may as quickly as possible be gathered to those fathers and die within twenty years, so that we may not see those terrible woes and afflictions, both spiritual and physical, of the last time. Amen (LW 1:335-336). Notice first how O'Connor set up the quote: "After the dominion and power of the Pope has ceased . . . the people, while despising the true doctrine, are now changed into mere irrational animals and beasts…" In context, O'Connor left out the middle part of the sentence continues, "who have ruled the world solely through the fear of punishment, is over...." It's interesting that he left out that part of the sentence which speaks negatively about the dominion and power of the Pope that ruled the world "solely through the fear of punishment." Notice also that Luther's comment isolated by O'Connor finds its true theological meaning within the entire context. He begins by describing the state of the world before the Noahic flood.Only eight were saved by the ark. He concludes this section by biblically describing the world before the "Last Day." Destruction will come upon the world like a thief. "Terrible woes and afflictions, both spiritual and physical" will once again afflict the world in an all-consuming way similarly to the great flood. O'Connor is correct that Luther saw the world as becoming worse because of the preaching of the Gospel. With this context though, we see again the reoccurring theme that Luther viewed his time period on the cusp of the return of Christ. In my explorations into Luther's theology I've never come across him stating the opposite- that because of the preaching of the Gospel, the world would become more holy and pious. For Luther, mankind has and will always oppose God's truth en masse and rebel against it, for that's what Satan and sin have always done in battle against God's word. Luther consistently held that the Gospel would find great opposition, and would be attacked from all sides. The Gospel would be used by the world as a licence to sin and all sorts of evil because of Satan. The Gospel would indeed make those of the world worse. But on the flip-side, the Gospel would also transform those whom God intended to redeem, and they are those who comprise the church, however few in number they may be. I wish I had time to write up an article on this, but I just don't have the time. Martin Luther praised Mary and said that she should be honored in his very last sermon at Wittenberg? Over the years I've noted the difficulties in checking the citations Roman Catholic apologists use. When I first began researching Luther quotes posted by Rome's defenders, it was not uncommon to find shoddy documentation (like simply a sermon name and date). If references were given they were often to out-of-print German or Latin sources or out-of-print secondary sources. I can think of no instance of a cyber-dialog I've had with one of Rome's defenders in which they offered a German or Latin reference they had actually read in its German or Latin context (and mined out the quote for themselves and translated it into English). The point of this tedium is that it's a good idea to read the context of that from which you say you are quoting from. Some of these contexts are not hard to track down, but are readily available. Some were even available all those years ago when I first began these explorations. These are only a few examples. Many more could be given. The picture being put forth is that in his last Wittenberg sermon Luther "venerated Mary," "had nice things to say about Mary," "was devoted to Mary," and had Mary "ingrained in his soul." Let's take a closer look to see if the actual context supports these interpretations. Is Christ alone to be venerated? Rather is not the Mother of God, too, to be honored? She is the woman who crushed the serpents head. This poetic rendering is not the work of William Cole, but rather from Bishop Daly of Ardagh as presented in The Irish Catholic, May 1969 in an article entitled, "Luther Loved Mary." Cole indicates that Daly’s study was an example of a “simplistic, uncritical, one-sided evaluation[s] of Luther’s Marian stance…” (p 98-99). Such could similarly be applied to Rome's cyber-defenders who mis-read Luther's last Wittenberg sermon. Cole actually goes on to cite more of Luther's comments from this very sermon and agrees with those who conclude Luther forbids praying to Mary, he denied the intercession of Mary, and he "dissuaded or excluded her invocation" (Cole, p. 158). The quotes above do reference WA 51:128-129. These pages can be found here. WA 51 includes two versions: a Latin version with some German words mixed in and a full German version (both on the same pages). Technically, Luther did not write this text. These printed words are from the notes of Georg Rörer who heard and took notes on Luther's sermon. The sermon was published not long after Luther's death in 1549 (See LW 51:371). I began above by explaining that some of the quotes used by Rome's defenders do not require English speaking people to consult out-of-print German and Latin sources. This sermon is a case in point. It was published fully in Luther's Works, English edition. All Rome's apologists would have had to do was go down to a good library and pull it off the shelf. Ironically, while the Latin German is in WA 51, the English rendering is in LW 51: 375-376. Therefore, when we preach faith, that we should worship nothing but God alone, the Father of our Lord Jesus Christ, as we say in the Creed: “I believe in God the Father almighty and in Jesus Christ,” then we are remaining in the temple at Jerusalem. Again, “This is my beloved Son; listen to him” “You will find him in a manger”. He alone does it. But reason says the opposite: What, us? Are we to worship only Christ? Indeed, shouldn’t we also honor the holy mother of Christ? She is the woman who bruised the head of the serpent.﻿ ﻿ Hear us, Mary, for thy Son so honors thee that he can refuse thee nothing. 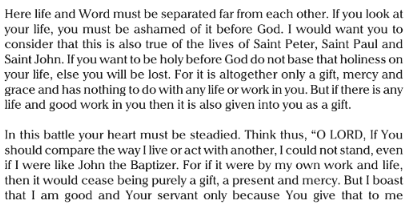 Here Bernard went too far in his “Homilies on the Gospel ‘ Missus est Angelus .’ ”﻿ ﻿ God has commanded that we should honor the parents; therefore I will call upon Mary. She will intercede for me with the Son, and the Son with the Father, who will listen to the Son. So you have the picture of God as angry and Christ as judge; Mary shows to Christ her breast and Christ shows his wounds to the wrathful Father. That’s the kind of thing this comely bride, the wisdom of reason cooks up: Mary is the mother of Christ, surely Christ will listen to her; Christ is a stern judge, therefore I will call upon St. George and St. Christopher. No, we have been by God’s command baptized in the name of the Father, the Son, and the Holy Spirit, just as the Jews were circumcised. Therefore, just as the Jews set up all over the land their own self-chosen shrines, as if Jerusalem were too narrow, so we also have done. As a young man must resist lust and an old man avarice, so reason is by nature a harmful whore. But she shall not harm me, if only I resist her. Ah, but she is so comely and glittering. That’s why there must be preachers who will point people to the catechism: I believe in Jesus Christ, not in St. George or St. Christopher, for only of Christ is it said, “Behold, the Lamb of God, who takes away the sin of the world”; not of Mary or the angels. The Father did not speak of Gabriel or any others when he cried from heaven, “Listen to him [LW 51:375-376]. shouldn’t we also honor the holy mother of Christ? She is the woman who bruised the head of the serpent.﻿ ﻿ Hear us, Mary, for thy Son so honors thee that he can refuse thee nothing. God has commanded that we should honor the parents; therefore I will call upon Mary. She will intercede for me with the Son, and the Son with the Father, who will listen to the Son. So you have the picture of God as angry and Christ as judge; Mary shows to Christ her breast and Christ shows his wounds to the wrathful Father. That’s the kind of thing this comely bride, the wisdom of reason cooks up: Mary is the mother of Christ, surely Christ will listen to her; Christ is a stern judge, therefore I will call upon St. George and St. Christopher. The warm praise which Luther has for the Mother of God throughout his life, his last sermon on 17 January 1546 included, is not based upon the great qualities of Mary herself but upon the grace granted to her. As a person, Luther can say, the Virgin Mary is not greater than Mary Magdalene, the sinner, since through faith all Christians are equal[Heiko A. Oberman, The Impact of the Reformation, (Grand Rapids: Wm. B. Eerdmans Publishing Co.,1994), 242]. I don't see any sort of "warm praise" in "his last sermon on 17 January 1546." Luther’s tone is quite sarcastic and mocking. One of Rome's defenders thinks the actual negativity expressed by Luther is simply addressed to Bernard: "... in context, this sermon is actually critical of 'Bernard's' use of honor - Bernard, in Luther’s opinion went too far. Luther still supports honoring Mary, just not so far as Bernard went." There are no comments from Luther in this context supporting the "honor" of Mary... whatever that means... saying nice things about Mary is not quite what Rome means by honoring Mary. I could just as easily describe Mary as the "mother of God" without any inkling of veneration. In context, by the way, Luther accuses reason, and then goes on to give the example of Bernard's reasoning specifically. He then returns to criticizing reason generally. When Luther asks, "shouldn’t we also honor the holy mother of Christ?" the implied answer is: NO. This blog entry is a revision of an entry I posted back in 2007. The original can be found here. Because so many sources are now available online, I'm revising older entries by adding additional materials and commentary, and also fixing or deleting dead hyperlinks. Nothing of any significant substance has changed in this entry from that presented in the former.